The Institution of Engineering and Technology (IET), publisher of the IET Wiring Regulations which set the standards for electrical installation in the UK, outlines some of the possible causes of the horrific fire at Grenfell Tower, West London. 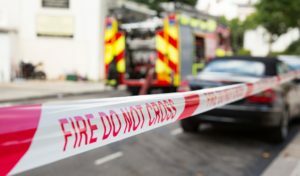 Mark Coles, Head of Technical Regulations at the Institution of Engineering and Technology (IET) said: “This is a horrendous fire that has spread at an incredible pace. The focus of the authorities now is to rescue and account for those caught up in this terrible incident and our thoughts are with the victims and families. “It is inevitable that there will be speculation about the cause of this dreadful incident. The authorities will conduct a full inquiry in due course as it appears that there has been a catastrophic failing. All relevant standards will need to be revisited to ensure they’re sufficient and that a similar tragic incident doesn’t happen again. “Those responsible for the enquiry will need to consider a number of possible causes of the fire and, not least, how the fire was able to spread throughout the building so quickly. “Each residential dwelling requires a connection to utility supplies, such as electricity, gas and water and, therefore, holes need to be made in the walls to allow the cables and pipework to enter. Once the cables and pipework have been installed, the holes need to be sealed to stop the spread of smoke and fire. As the building had recently undergone refurbishment, it seems likely that this may not have happened. “Other considerations are emergency escape lighting and fire alarm systems. Both systems are required to be installed to British Standards and each of those standards require regular checking of those systems, for example, checking fire alarm call points and smoke detectors weekly to ensure they are working correctly. “Another aspect of investigation will focus on consumer units, often referred to as ‘fuse boxes’, within each dwelling of the tower block. Since 2015, it has been a requirement of the IET Wiring Regulations, adhered to by all electricians, for the consumer unit in a residential dwelling to be made of non-combustible material (i.e. steel, not plastic). This change was made as a result of an increase in fires in residential dwellings where the plastic casing of consumer units caught fire.